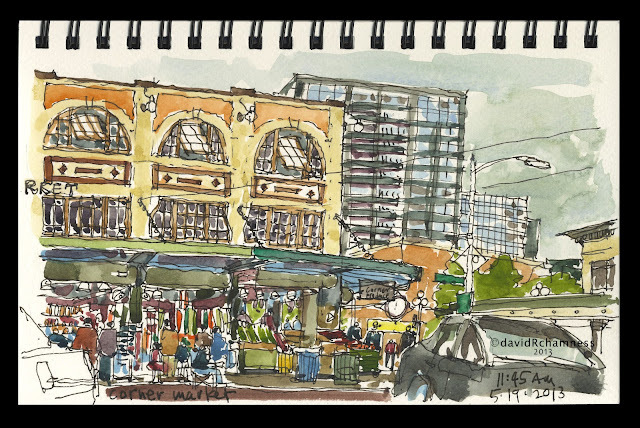 Sunday was a great day to sketch outdoors and to be at the Pike Place Market. The temperatures have finally warmed consistently enough that the hands don't stiffen up and the spring showers held off from disrupting our monthly sketch crawl. The sky was disappointing because it was grey and the clouds had no definition to them. The market was bustling with people and so I found an out-of-traffic location between parked cars to sit and sketch the Corner Market Building. It is one of the older buildings in the market, constructed in 1912 (the first building, the Main Arcade, opened in 1907). Jackie (another Sketcher) was directly in my line of sight sitting at the curb sketching the Main Arcade and chatting with passersby. No one bothered me today because I was against the back of the stalls where only vendors come out to have a smoke break.